and Jan/Feb 2005 Blue Ridge Country Magazine. 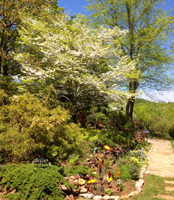 Welcome to Mountain Laurel Creek Inn and Spa and Dancing Bear Cottage. 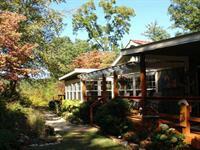 A B&B and Boutique Day Spa in Dahlonega, GA - Dahlonega's most Romantic B&B with the Finest Accommodations in the County! 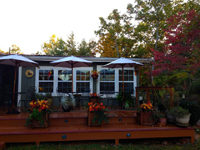 Also available is a one bedroom cabin, Dancing Bear Cottage, which features a living room, eat in kitchen, screened in porch with hot tub, steam shower, jetted free standing tub and many other luxury items. Sit on the front porch rocking chairs, or the Gazebo next to the fish pond, take a stroll down our trail to the creek, or do nothing at all. 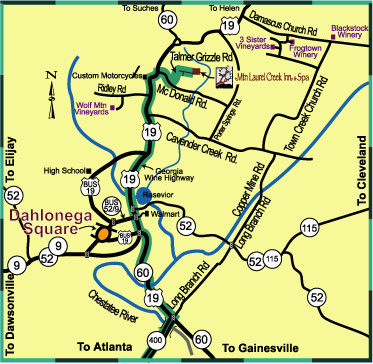 We are right in the middle of Georgia Wine country, only minutes away from five our our local wineries, just an hour and a half from downtown Atlanta, but worlds away. While at MLC, enjoy a massage, hot stone massage, reflexology, and specialty facials for anti aging, acne, at our onsite spa. Spa is open to the public by appointment only. For that truely romantic, peaceful getaway for that special occasion, our just because you deserve it, visit Mountain Laurel Creek. Take Hwy 19 north from Dahlonega, go 6 miles, turn right onto McDonold Rd, (at hwy mile marker 18) and make your next left onto Talmer Grizzle Rd.